“The harder I work, the luckier I get.” This quote and variations of it have been attributed to Thomas Jefferson and Samuel Goldwyn, among others. We may never know who actually said it, but regardless, the sentiment is clear: Luck is something we make for ourselves through perseverance, work, and by seizing opportunities. This seems especially apropos as we celebrate St. Patrick’s Day this week. It’s a reminder that we can all be Irish for one day, and lucky, IF we work hard enough! As we all know, there are potentially huge changes looming in healthcare and long-term care. Nothing could be clearer than the need to develop leadership in this environment. The Summer Leadership Conference, to be held in Bermuda from July 24–28, 2017, is an opportunity to do just that; it provides a unique, once-a-year chance to replenish, recharge, and refocus. 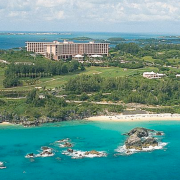 This is the 35th annual edition of The Summer Leadership Conference, a testament to its value to the participants (many of whom have been coming for years), and its endurance as a high-level event, attracting leaders who want to share experiences, in addition to exploring all the recreational, leisure, and sports-related activities Bermuda has to offer. In light of the coming changes and potential challenges in our industry, let’s work harder, play harder, and conjure up some luck! Consider joining your colleagues, earning 15 CEUs, and recharging those leadership batteries! We’re thrilled to have as our Facilitator for the 2017 Summer Leadership Conference, Clint Maun, Maun-Lemke President and Senior Partner. Read more about the program! Today’s organizations will ﬁnd it difﬁcult to be successful without the use of teams to produce important improvement and operational stability. This is particularly true when developing Quality Improvement teams for recruitment, selection, retention, and marketing related teams. To produce a successful team you need to develop boundaries for the implementation of successful group activities. This session will truly allow your team to advance to the next level by facilitative lecture and practice. Learn more about our facilitator Clint Maun. Today’s organizations must promote proactive leadership techniques which drive measurable results for improvement and growth. There is no time left for process without results. Attendees of this invigorating session will learn speciﬁc techniques for engaging their co-workers for successful team-based efforts, customer service initiatives and ongoing daily outcomes. This session will include speciﬁc methods to enhance leadership that encourages results with techniques that can be easily implemented. To run a successful organization, we must have dedicated, quality co-workers that embrace the team concept. Like never before, we’re being challenged to ﬁnd the quantity and quality of co-workers necessary to be involved on our team. It is possible to reduce turnover lower than the national average in a short period of time by using team-based involvement. Implement methods for recruitment utilizing existing staff. Develop behavioral interviewing and selection techniques. Coordinate speciﬁc retention techniques (turnover reduction) including mentoring and orientation. Implement successful self-reporting system that develops team-based accountability and motivated behavior on a daily basis. This program will rely heavily upon case-study and real-life examples of reasons why an employee eaves, the effects on personnel availability because of negative advertising and practical and innovative techniques for advertising. You can view the full presentation here. This is certainly true in both Bermuda and the United States. With very similar demographics, including progressively aging populations, and growing dependency ratios, post-acute care services are drawing significant new attention. Government bodies in the US such as the Centers for Medicare and Medicaid Services (CMS), as well as private intermediaries are looking for efficiencies and economies in the post-acute, or long-term care systems. Dr. Fleming described the current situation in Bermuda for lodging, rehabilitative, and respite services as, “a crisis situation,” and suggested that only political will would resolve the current difficulties. While the supply and demand situation in the US probably isn’t at a crisis, there certainly are imbalances which government and private market forces are attempting to rebalance. Claudette described the government penchant for commissioning study after study, while the underlying issues go unaddressed. In the US, we call this “kicking the can down the road”. Another painful fact which Bermuda shares with the US is the extraordinarily high cost of healthcare. While it is common to refer to the United States as the most expensive health care system in the world, in fact, Bermuda ranks 3rd among developed economies. Amazing, considering the small size of the country. The cost of health insurance is another painful similarity. The Bermuda market is of course much smaller than the US, with a population of only 64,000 versus 384,000, the actuarial characteristics of the risk pool mean that health insurance is staggeringly expensive for the average Bermudian family, often costing $10-$15,000 per year. There is no “safety net” insurance available for the island’s poor, such as the Medicaid program in the US. Moreover, with an age-targeted infrastructure that has been developed like topsy, many Bermudian hospital beds are taken by aged consumers who, while not in need of acute-care hospital services, have no other place to go where their chronic care needs can be met. There certainly are lessons to be drawn from developed countries around the world, including the US and Bermuda, about how to address the expensive and culturally critical care needs of each populations. Dr. Fleming’s “perspectives” are an excellent place to start.